The Indo Canadian comic keeps the Washington, DC, audience in splits with his different takes on life. This past Saturday, September 22nd, the DAR Constitution Hall in Washington, DC, was packed to the brim. Audiences of many different ethnicities, backgrounds and walks of life banded together to witness one of the most prolific comedians of our time. So prolific, that Rolling Stone Magazine named him as one of the 50 best stand-up comics of all time. That is the one and only… Russell Peters. By way of background, Russell Peters, who has been doing standup for many many years, gained worldwide attention when in the early 2000s, videos of his stand-up routines went viral on the Internet as the age of video sharing and downloading started to gain traction. In fact, it would not be an understatement to say that Russell Peters was one of the first success stories to come out of “going viral”. His numerous catchphrases such as “Somebody Gonna Get A Hurt Real Bad” and “Be A Man” became extremely popular, and the comedian ended up becoming one of the highest paid stand-up comedians in the world. His success was further enhanced with his funny stand-up specials, which screened on both Comedy Central and Netflix, such as Outsourced, Red, White & Brown, Green Card, Notorious, and Almost Famous. Russell most recently released a television show that he starred in, The Great Indian Detective, and several years back released a fascinating autobiography, Call Me Russell. The multi-talented comedian, originally from Canada but now a resident of Los Angeles, has been deemed a pioneer and legend amongst audiences and his peers. The program opened with a hilarious comedian from Nigeria, known as Basketmouth. Described by Russell as one of the biggest comedians from Africa, Basketmouth brought the house down with his routine comparing the differences between the United States and Nigeria, from a cultural and social standpoint. He truly was a great way to start the show, and audiences were particularly impressed with witnessing a international comedian to start the program. Following Basketmouth came Jake Johannsen, a legendary and very popular American comedian. Johannsen, with his bright eyes and incredulous expressions, was spot on with his satirical take on marriage and the complexities that come with it. His routine was very relatable and hit home for many, another great act precluding Russell. Then, after these two great comedians, Peters himself came and, needless to say, did not disappoint. Every joke worked perfectly. There was nothing that went over the head of the audience, nor was there anything that was too corny or cheesy. Peters kept the audience in splits with different takes on being in your late 40s, medical procedures, relationships, friendships and romancing your spouse. Of course, Peters displayed his excellence at improvisation – by picking on random audience members and asking uncomfortable questions. No comedian that I have seen does this better than him and it truly is incredible what he comes up with in the moment. One particular note I would like to make about this performance was how Peters’ comedy has evolved. He has been known for being the guy who focuses on ethnic humor, however we saw a new Peters last night, who presented a refreshing set of comedy that sometimes had ethnic humor but focused more on situations and real life problems that many have to grapple with. And he did it with the right aplomb. I appreciated this novel style incorporated by him and it seemed the audience did too, who laughed hard at each and every punchline. All in all, the Deported show met my expectations and surprised me (pleasantly) with the new comedic method. 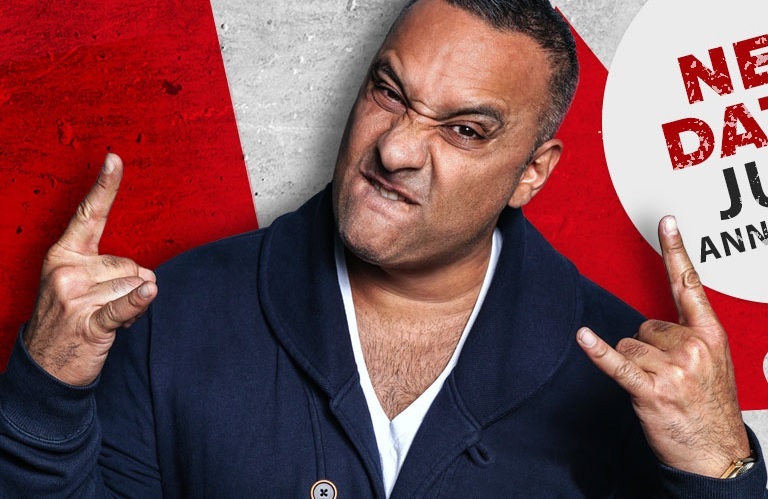 Looking forward to Russell Peters’ future tours and I can now firmly say that he truly is a comedy legend.